My last post was entitled ‘Tagore and the Gunny Bags’ but I didn’t develop that theme, which was about making connections between problems, in this case between the ruinous effect of plastic in our world and gunny-bag factories in Tagore’s day. This connection is about the manufacture and use of packaging materials in general having deleterious effects on the environment. Facilitating transportation is the key link between plastics and gunny-bags. This is part of the harm caused by markets, where transportation of goods made in one place for consumption in another is alienating, so that the additional material made and used just to help move the goods is lost sight of. Packaging material may or may not be reused or recycled or disposed of more-or-less badly – gunny-bags, hessian sacks, one assumes, were reused until they fell apart, but the benefits of plastic packaging have been taken for granted, and its problems largely ignored, since it was invented in the 1960s and re-invented as new uses were thought up. Only recently, with the oceans riddled with plastic of all shapes and sizes including micro-plastics found in many animals including ourselves, and shocking figures like the recent announcement that people in the UK throw away 295 billion pieces of plastic every year most of it wrapping food, most of it single-use, has anyone really cared enough for there to be a shift towards… and there’s the rub… towards what? With Tagore, permaculture and Transition in mind, I say: towards relocalisation, one village or neighbourhood at a time. Changes which are helpful are happening, with the substantial rise of local food growing. At a personal level, home growing and a vegan diet makes a real difference, however tiny. The combination of growing and eating is crucial. Buying vegan ready meals from the supermarket is not part of the a solution, in my view; it is continuing to collude with the system which has caused so much harm. The only solution to the horrendous plastics problem is relocalisation of food growing and processing, and distribution around each local community, without any plastic wrapping at any stage. Tagore’s work on reviving village society ‘one village at a time’ is even more relevant now than it was a century ago. Gunny-bags, hessian sacks, were the packaging of choice in Tagore’s day. Even if they were not primarily for transporting food, they were part of economic evolution facilitated by developments in transport infrastructure. To get a real understanding of what has happened it is important to hold on to the ‘plastics and gunny-bags’ idea because it includes the history. Linking Tagore’s ideas with what happened during and since his lifetime provides very useful markers. So, for example, it was only 20 years after Tagore’s death that the plastic bag was invented. A few years later the ‘container revolution’ began, and that is highly significant. About 30 years ago when I was carrying out research into land degradation worldwide, I often followed up the references included with articles in The Ecologist, which was a serious scholarly journal in those days before it was decided to make it a magazine for activists, and eventually to merge it with the new age magazine Resurgence. I remember there being a special issue of The Ecologist on transportation based on the observation that every advance in transportation technology brought about a new and worse phase of environmental destruction. Without much hope of finding that issue in the archive, I searched online and found it, thanks to Teddy Goldsmith, founder of The Ecologist, who had requested that issues from 1970 to 1999 should be available free for all to view. The one I remembered was Vol. 23, No. 4, July/August 1993. It has an Editorial entitled ‘The Infrastructure Lobby: “The Slow Breathing of the Monster”’ in which Simon Fairlie describes the Kondriatev cycle whereby the industrial economy seemed to expand and contract in waves lasting approximately 50 years, and links that to the suggestion by Andrew Tylecote that each of the boom periods is associated with the successful emergence of a new “technological style”, characterised by a new form of transportation. Two forms of transport which fit the Kondriatev/Tylecote economic pattern in the UK were the economic upswing stimulated by canal systems at the end of the 18th century, then the rising boom period in 1844-1870 and the emerging rail network. The pattern is more complicated in the 20th century due to periods of waves and troughs being punctuated by two world wars. The links between major changes in transportation styles and economics booms were present. The electric suburban railway was developed in the decade of boom after 1918. After the 1930s slump and World War II there was Fordism in the ‘production of motor cars and aeroplanes, supertankers and motorways – a transnational oil-based economy that only started to weaken after the oil crisis of 1973’. 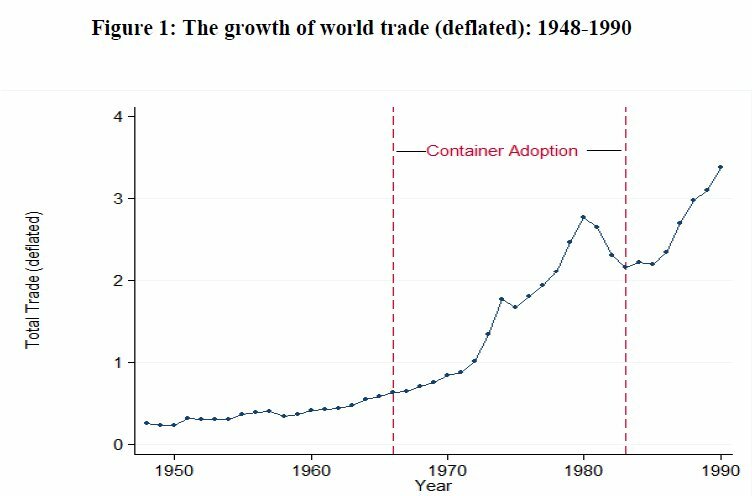 We can see where the invention in the 1960s of plastics and shipping containers fits in the picture of changes in world trade in a diagram from an article entitled: ‘Estimating the effects of the container revolution on world trade’ by Daniel M. Bernhofen and others. This has not been the last word on ‘Tagore and the Gunny Bags’, or on the themes of making connections between problems and replicating beneficial solutions. Some years ago, when I set out from Calcutta on my voyage to Japan, the first thing that shocked me, with a sense of personal injury, was the ruthless intrusion of the factories for making gunny-bags on both banks of the Ganges. The blow it gave to me was owing to the precious memory of the days of my boyhood, when the scenery of this river was the only great thing near my birthplace reminding me of the existence of a world which had its direct communication with our innermost spirit.